Baltimore City has completed a new report on the failures and problems with their Speed and Red Light camera programs. Baltimore City's speed and red light camera programs have been shut down at the end of 2012 after revelations that the city's speed cameras had systematically issued tickets to motorists who were not speeding. Contractor Xerox admitted that at some sites five percent of tickets issued were actually speed measurement errors, and a later independent audit found that as many as 10% of citations were due to apparent errors and should not have been issued. These admissions were prompted by an extensive investigation by the Baltimore Sun, which revealed that stationary cars had been ticketed for speeding and documented the problem to the point where it could not be denied. The Maryland Drivers Alliance had published speed camera videos and images showing large trucks apparently moving far slower than the speeds they had been accused of. Emails obtained by the Maryland Drivers Alliance in 2012 showed the city had been aware speed camera tickets had been issued based on erroneous speed measurements months before the city finally took the cameras offline and the problems were publicly admitted. The report examined over 10,000 documents. They did note however that a single investigator had been assigned to the task, and funding for the investigation was cut off in January 2015. Over 200 requested documents were "unreadable" due to what the Law Department called a "software glitch". Furthermore the remaining "millions" of documents the Law Department stated existed were not produced, and investigators stated they had insufficient time to examining them. The investigation primarily looked at contractual issues and the actions of the city's contractors and some city employees, rather than the technical causes of erroneous citations. The report discussed how after Xerox lost the contract with the city to a new vendor, Brekford, Xerox did not assist Brekford by supplying software needed to operate the city's existing cameras. "The committee noted that Xerox made things worse by it's continued course of conduct during the fall of 2012. It clearly wanted to maintain control of the system despite having lost the contract to Brekford. In its negotiations with Brekford, there is evidence not only of this attempt to maintain control but also to reap the vast majority of the bounties then available under the contract." "The documents that were reviewed also contained allegations that Xerox deliberately sabotaged City property. A number of them point to an alleged tampering event in which Xerox technicians made two camera units inoperable on the last day of the contract. ", stated the report, however the report claimed the allegations could not be confirmed since the law Department failed to produce additional documents related to the alleged incident. The report discussed how the city's new speed camera contractor Brekford sought to have Richard Retting, a photo enforcement expert responsible for many of the studies the industry uses in support of photo enforcement, hired to conduct a supposedly "independent" safety review. Retting has been closely associated with Brekford Corp, and Brekford has described Retting as a "Brekford AGTE Partner" in corporate presentations. The report referenced an email exchanged between Brekford CO C.B. Brechin and Retting stating "Great news, we were able to get the City of Baltimore to hire you separately so it looks independent... Again thanks for all your service." The report stated "the choice of words in the email leads one to question the propriety of this hire." Investigators stated they forwarded this to the City Solicitor for investigation but never received a response. The report showed how the city was more concerned with the perception of errors than the actual fact that some motorists would be falsely accused. "The real challenge will be getting the media to accept that, while the city is doing everything we can to improve the accuracy rate, the system will not be perfect and some (very small) percentage level of error may still occur," program manager Jamie McDonald wrote in a March 14, 2013 email. The report recommended that the city implement a smaller program, and the Mayor is moving ahead with an RFP to obtain bids for a new contract. Some state lawmakers who voted for speed cameras apparently also believe that the public should accept a certain rate of erroneous citations. So called "reforms" implemented under changes to the law passed in 2014 by the state legislature explicitly states that an error rate of up to 5%, one ticket in 20, is acceptable before a contractor would be penalized. For a program the size of Montgomery County's existing program or Baltimore City's previous program, this would permit tens of thousands of erroneous citations per year. Errors have been proven and/or alleged in many other local speed camera programs in the state aside from Baltimore, however no other program has been subjected to the type of detailed audits that Baltimore's program has. 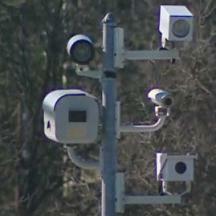 Local governments in the state strongly resisted calls for speed camera programs to be subject to regular independent audits and state lawmakers refused to include any form of auditing or independent outside oversight in so called "reform" legislation, and the sponsors of the 2014 legislation refused to include any such requirements. Xerox has speed camera contracts for programs in Montgomery County, Rockville, Gaithersburg, Chevy Chase, and Baltimore County, and is also the vendor for the SHA's program. Brekford holds contracts for several municipal programs in the state including Salisbury, Greenbelt, Laurel, and Hagerstown.